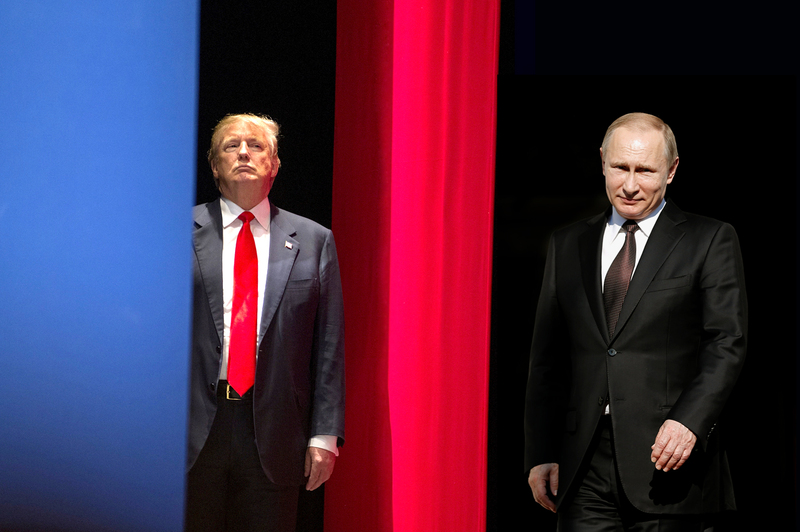 Collage: Donald Trump and Vladimir Putin. In their 45-minutes talk, presidents have discussed a range of issues from tackling terrorism and Middle East developments, to strategic stability and business ties between Russia and the U.S.
Moscow and Washington spoke positively about the first conversation between Vladimir Putin and Donald Trump, who was sworn in as the U.S. president slightly more than a week ago. The leaders discussed a wide range of global and international issues in a "positive and business-like atmosphere" and agreed to keep in touch, the Kremlin press service said. "The positive call was a significant start to improving the relationship between the United States and Russia that is in need of repair," the White House said in a statement, commenting on the results of the conversation. The two leaders discussed in detail "pressing international problems," including the developments in the Middle East, the Arab-Israeli conflict, the strategic stability and non-proliferation, the situation around Iran’s nuclear program and the Korean Peninsula, the Kremlin said in a statement. "The key aspects of the Ukrainian crisis have been touched upon as well. It has been agreed to establish partner-type cooperation in those and other areas," the statement reads. Putin and Trump placed a special emphasis on the fight against terrorism. "The presidents spoke in favor of creating real coordination of Russian and American actions with a purpose to defeat the ISIL (the former name of the Islamic State) and other terrorist groups in Syria," the Kremlin statement reads. Alexei Pushkov, a member of the Defense and Security Committee of the Federation Council, wrote in his Twitter account that discussing coordination in anti-terrorism efforts "represents a qualitative change" in bilateral ties, while the first deputy chairman of this committee, Frants Klintsevich said the Islamic State will literally see its last days if Moscow and Washington join forces. The head of the State Duma International Affairs Committee said the declared intention to coordinate anti-terrorism effort was the most important result of the talk. "The main result of the first talk between Vladimir Putin and Donald Trump was an agreement to coordinate efforts to defeat the IS. This is what the entire clear-headed world is expecting from the Russian-U.S. relations," Leonid Slutsky said. Lawmaker Nikolai Kovalev, who formerly headed Russia’s security service FSB, named "coordination of efforts in Syria, joining forces, exchange of information" and an end to U.S. weapon supplies to the Syrian opposition as the first practical steps that the U.S. may make in the declared joint Russian-U.S. antiterrorism struggle. He said Washington previously refused to cooperate with Moscow on the issue, but "this situation may now change drastically." Putin and Trump also discussed restoring trade and economic ties, that could "further stimulate consecutive and sustainable development of bilateral relations." Kirill Dmitriev, who heads the Russian Direct Investment Fund (RDIF), said the results of the first official contact between the presidents of Russia and the United States send a positive signal to investors. "Placing the emphasis on restoring trade and economic cooperation is very important," he said. The RDIF CEO added that the fund has designed ten Russian-U.S. priority investment projects and will present them to the U.S. partners for a preliminary discussion soon. The head of the State Duma’s committee on science and education, Vyacheslav Nikonov, also pointed at the economic part of the discussion. He said that the declared readiness to restore trade and economic ties "may envisage a partial cancellation of sanctions." "Of course, the word ‘sanctions’ was left out, but restoring trade and economic ties stipulates that this issue has to be approached as well," said the lawmaker, who is also a prominent Russian expert on foreign affairs. Russian politicians were overly positive about the results of the first Putin-Trump talk after the transition of power in the United States. "Naturally, a phone conversation between the two presidents is not enough to solve all problems in the Russian-U.S. relations, which had been accumulating for years. But the first step has undoubtedly been made," senator Klintsevich said, adding that Trump appeared to be taking cooperation with Russia seriously. However, he warned against jumping into optimistic conclusions before the US makes its first practical steps. Konstantin Kosachev, who heads the International Affairs Committee of the Russian parliament’s upper house, said the phone conversation apparently "returned sense and reason" into the Russian-U.S. dialogue. "Hopefully, behind the laconic mention of the matters discussed, there is determination - bilateral determination, not only on our behalf - to introduce the new format of relationship, the relations of partnership instead of rivalry," he said. Vyacheslav Nikonov also described the phone talk as "a very good start." "They set the bar very high at the talks," he said. "The fact that they managed to discuss this (wide range of issues) in 45 minutes means that there were no major disagreements."